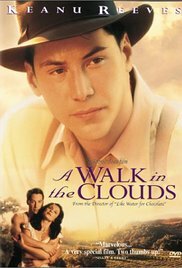 The most inspiration in the movie comes from grapes (and wine), since much of the movie takes place in the family vineyard. Ultimately I was inspired by a scene near the end when there is an unexpected fire in the vineyard, potentially devastating the family. Hubs told me I was getting a bit dark, getting inspired by a tragedy and all, but the resulting salad is delicious! The roasted grapes bring an intense pop of sweetness that perfectly balances with the earthy spinach, tart balsamic, peppery basil, and salty cheese! Instead of dressing, the warm pan juices are poured over the salad for a sweet treat! 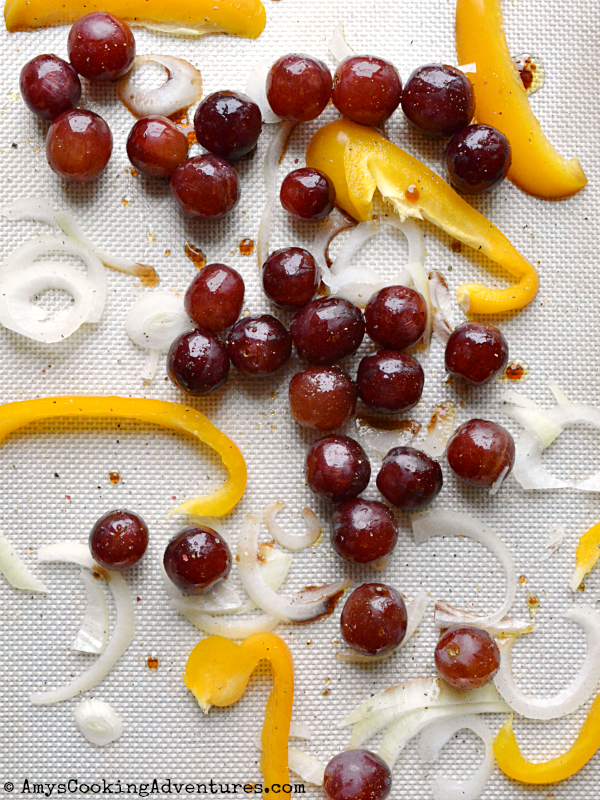 Place the grapes, bell peppers, and onions onto a lined baking sheet. Drizzle with balsamic vinegar and olive oil. Season with salt and pepper. Bake in the preheated oven for 10 minutes, stir, and cook for another 5 minutes or until the vegetables are soft and the grapes release some of their juices. Remove from the oven and cool for about 5 minutes. Place the spinach in a bowl. Top with the roasted grape mixture, and sprinkle with feta, sunflower seeds, and basil. 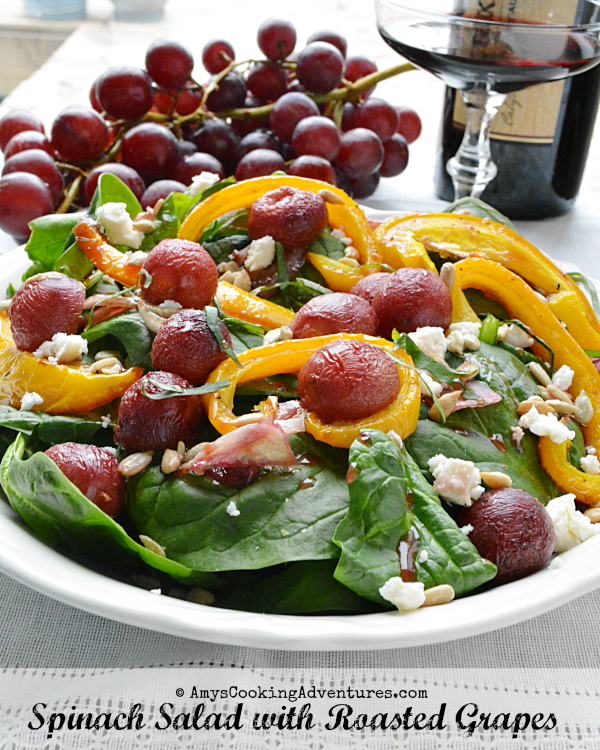 Drizzle the roasted grape pan juices over the salad and serve. It certainly is pretty. I am so glad you enjoyed the movie. Hahaha, your husband sounds a lot like mine! 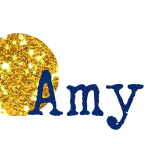 But, hey foodie inspiration can come from anywhere! :) The salad looks great. I love the addition of basil! I was inspired by the same scene - dark or not. Glad you loved it. 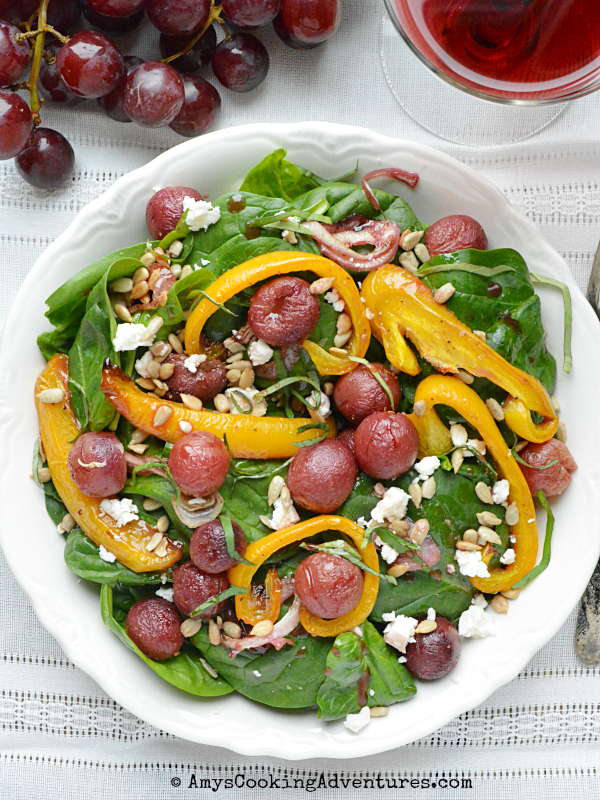 Mmmm...roasted grapes are my favorite, they sound perfect in this spinach salad! I really like where you and Camilla went with your inspiration! Geniuses! Loving all the grape recipes this month. That is pretty. I love feta on anything.